Depressed valuation reflects several years of under-delivering versus the company’s own guidance and versus the chemical sector in aggregate. Optimism has become rampant – consequently investors place little faith in current forward estimates. Recent consolidation of reporting segments makes the task of modeling the business harder potentially turning off investors. It also suggests increased commoditization. The “specialty” businesses that are showing volume growth are losing pricing. All this compounded by the stigmatized cigarette filter business. 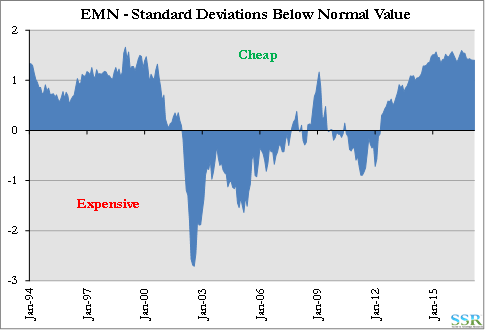 Our normalized earnings model suggests a mid-cycle value of $150+ for EMN. 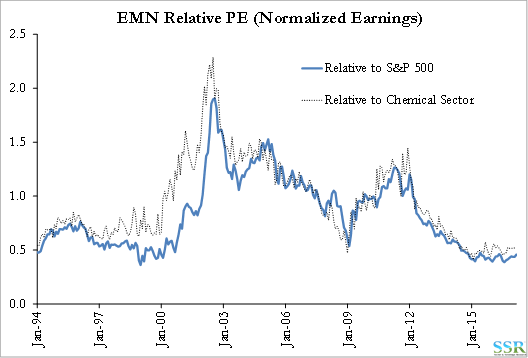 At the average FCF yield in the Chemical space, EMN shows about 50% upside to current. Despite a recent bounce off an extreme low, all metrics suggest the stock is still trading at a considerable discount. With much larger companies coming under fire for chronic complexity and underperformance (GE, APD, DD, DOW, and now Akzo), EMN looks like a manageable midsized target for activism or for an acquirer who might ultimately break up or spin off pieces. If an activist can find a 40% slice of the company that would trade at a middle of the pack multiple (which should be easy and we could make a case that more than 60% could fit that category) – that could be a quick and easy 20% gain in EMN’s value (up to $96). We do not believe that the stub would trade any lower than the whole does today. 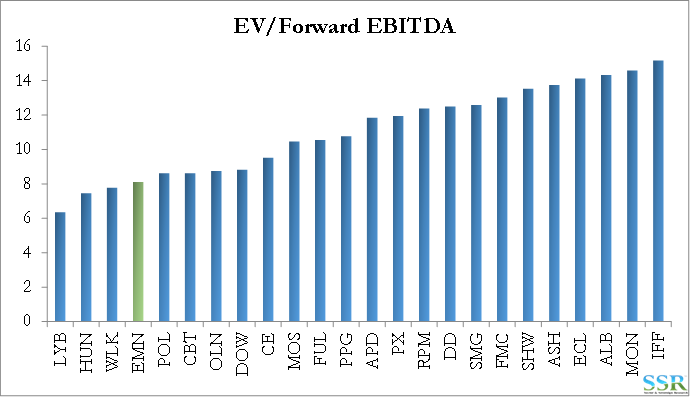 With M&A multiples in the mid-to-low teens, EMN at 8x forward EBITDA is a bargain, especially for someone looking to exit a commodity business which could be combined with Eastman’s fibers business. At 11x forward EBITDA the price would be $120 per share. Eastman remains one of the more talked about companies in the sector and not only with investors. At recent industry conferences we were surprised by the number of corporates and consultants who were effectively asking “what’s up with Eastman”, all trying to understand why the wheels appear to have come off a company that only a few years ago seemed to be doing everything right and seemed to be one of the darlings of the sector. Nothing shows Eastman’s fall from grace as well as the relative PE lines in Exhibit 2 – this is a very good measure of investor confidence. 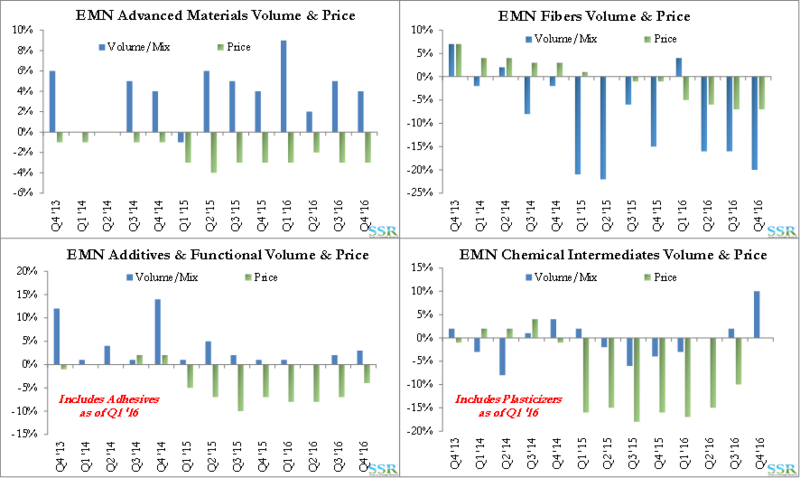 While the company is seeing some volume improvements in all segments except fibers in recent quarters, the company continues to lose price, which is an indication that the specialty businesses may not be all that special. Costs are down with lower energy prices, but overall the business look less robust than they are advertised to be – Exhibit 3. The company is a mixture of complicated hard to understand businesses which for the most part do not exhibit the margin cycles of a typical commodity chemical, except for the Fiber segment which has clearly commoditized in recent years, more because of capacity additions than because of weak demand. EMN has been lucky in this business because its input costs (Appalachian coal mainly) have also fallen. However, some strategic missteps, such as a very painful propane hedge and the apparent failure to find a buyer for the ethylene facilities have destroyed investor confidence and the whole company now trades like a highly cyclical commodity company. We see this as a major opportunity, either for an activist with what does not need to be an overly complex break-up or run better plan, or for an acquirer. We think the most logical acquirer would be a company with its own lagging commodity business, where the opportunity would be the ultimate carve out of a commodity company leaving a larger – higher multiple – specialty core. The more obvious buyers are European and the strength of the dollar is an issue today. 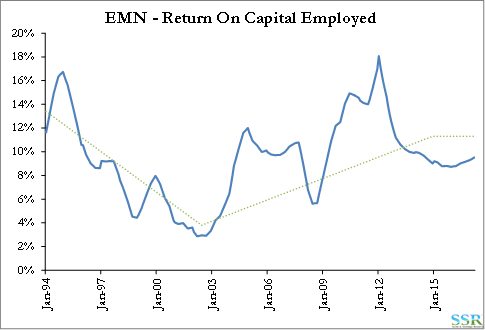 It is well established that EMN has struggled to meet growth targets in recent years. Strong earnings momentum and upside revisions in the early part of this decade gave way to more modest beats and slowing growth before initial estimates proved overly optimistic in each of the last two years, worsening in 2016 even as the ill-timed propane hedges diminished – Exhibit 4. 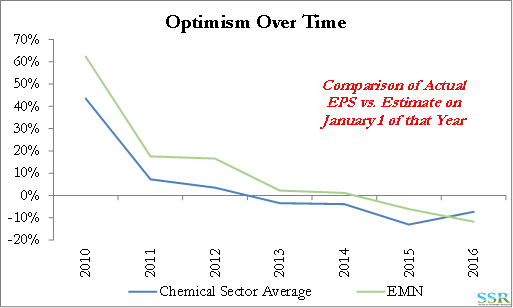 This trend was not dissimilar to that seen in the Chemical sector in aggregate – Exhibit 5 – but while the sector became slightly more self-aware in 2016, EMN grew more optimistic. 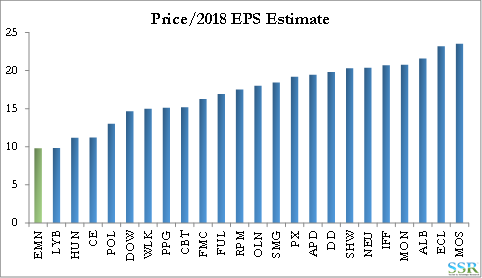 Forward estimates (2017 and 2018) have come down considerably more than the sector average over the past year – Exhibit 6. 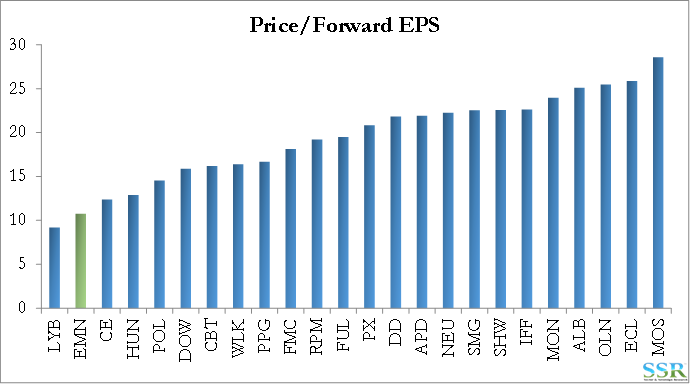 Eastman’s discount from normal value based on normal earnings derived from the return on capital trend in Exhibit 7 places it among the cheapest stocks in the chemical sector – Exhibit 8. 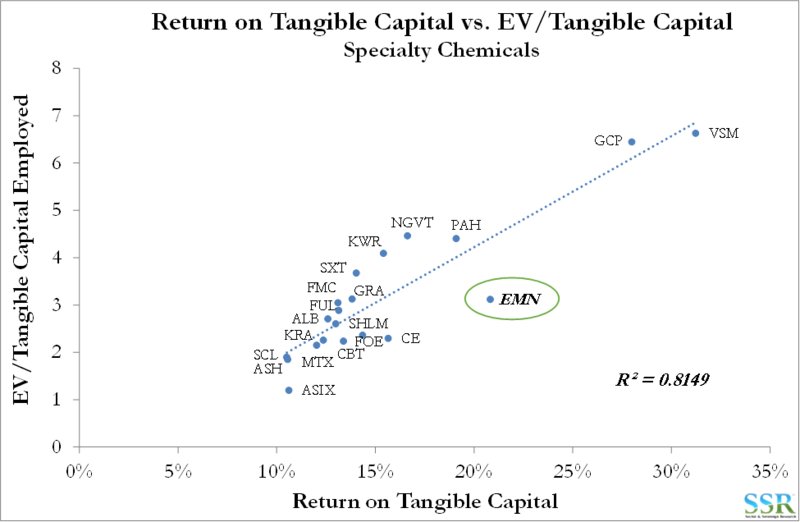 Looking at returns on tangible for a specifically Specialty Chemicals group – Exhibit 9 – EMN is valued on par with companies that have returns more than 10 percentage points lower. 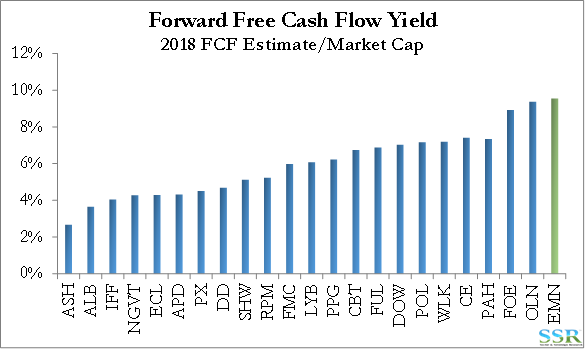 Free cash flow yield and the traditional valuation multiples of earnings and EBITDA show EMN among the most heavily discounted stocks in the Chemical space, as seen in Exhibit 1 and repeated again below. 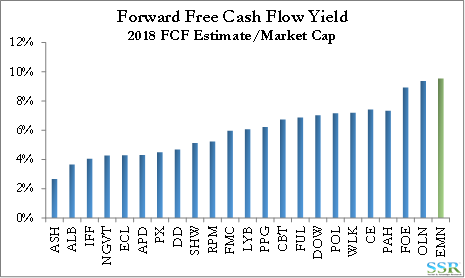 EMN’s cash flows (2017 or 2018) put it at or near the top of the sector on a free cash flow yield basis – Exhibit 10. 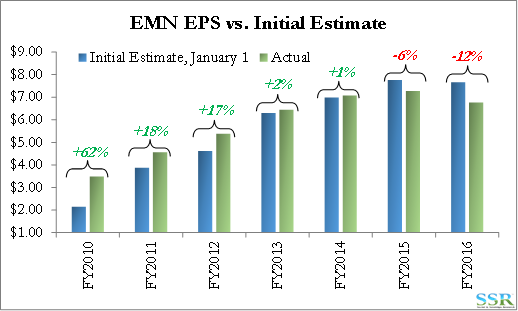 A move to the group average yield implies 50% upside for EMN. Traditional valuation multiples also expose the value in EMN – Exhibits 11 and 12.